So here are a few brain boosting, superfood filled, fuller for longer meals…. when I finish I’m eating cheesecake. 1. Take the salmon fillet out of the fridge. Put 50g basmati rice in a pan over a medium heat. Add 1tsp Garam Masala, leave for 1min. Add boiling water and 1 vegetable stock cube and whisk till dissolved. Leave for 10 mins or until a lot of liquid has evaporated but there is still a little left. Stir in 10-12 pistachio nuts, unsalted. Cover and set aside. 2. Chop 2 garlic cloves into small pieces. Fry in 1/2tsp oil for 2-3mins. Add pepper and 3-4tbsp lemon juice. Add 1/2 stock cube and 250ml water. Bubble till reduced by about half. Whisk in 2 light mini Philadelphia tubs till combined. Reheat and add a large handful of chopped dill, season to taste. 3. Meanwhile heat a frying pan over a medium heat NB DO NOT LET IT GET TOO HOT. When hot, add the salmon skin side down, unseasoned. Leave untouched for 5-7 mins till the skin is crispy. (NB mine was quite thick) Turn and cook for a further 2-3mins. The salmon should be a really vivid pink inside and tender, if it is too pale you have over cooked it, if it is still fleshy it is rare, better for a different recipe. Luckily mine was perfect 🙂 Finally steam the broccoli, serve. I’m not claiming this will get me a first but it certainly sent me into my exam smiling. Usually I am a great advocate of butter, try as I might to be healthy – even I have to admit butter makes everything taste better. In the light of healthy exam fuel I made my eggs with half fat creme fraiche. I am a convert, the creamiest, fluffiest scrambled eggs ever. 1. Chop 1 pepper into strips. Scatter with a pinch of salt. Microwave on high for 5-8mins (I did this the night before). 2. Whisk 3 eggs, pinch of salt, pepper and 1 tbsp light creme fraiche. Microwave for 30secs at a time, whisking between each spurt. BE CAREFUL NOT TO OVERCOOK, the eggs will keep cooking, so set them aside when they are still a bit runny. 3. Toast a bagel, top with the eggs (no butter), strips of smoked salmon, the pepper and a sprigs of dill. 1. Put 50g oats, 250ml unsweetened soy milk and a pinch of salt in a pan. Simmer for 5-6mins, stirring. Pour into a bowl. 2. Put 1 snack pack of blueberries in a pan with 2tsp sugar and 3tbsp water. Simmer for 5mins. Place on porridge with a small handful of salted pistachio nuts. 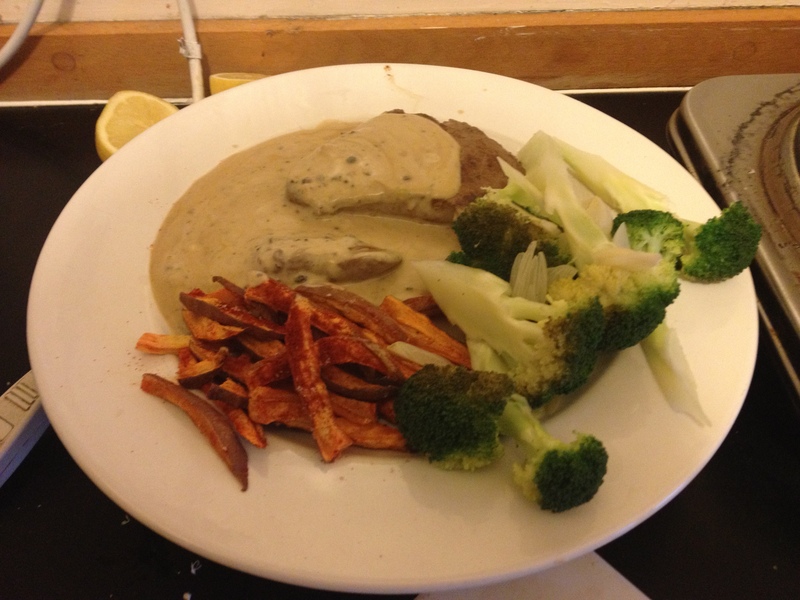 Lean Rump steak, light peppercorn sauce, paprika sweet potato chips, lemon and garlic broccoli, serves 1 – 15mins. 1. Chop 1 small sweet potato into thin strips. Scatter with sea salt and paprika. Roast on high in the microwave for 8-10mins. 2. Meanwhile heat a frying pan seasoned with a little salt and pepper. Trim the 200g steak of all visible fat. Chop 2 garlic cloves into thin slices and put in the bottom of a saucepan. Top with an in saucepan steamer and fill with chopped broccoli. Steam for 5mins. 3. Fry the steak for 3-4mins on each side for rare – medium rare. Set aside. Add 2 chopped cloves garlic into the steak pan. Fry for a minute. Add a good glug of cooking brandy (I know I’m off booze for exams but this is medicinal, and the alcohol is burnt off). Sprinkle in 1 crushed stock cube, 1tsp slightly crushed peppercorns and 150ml water. 4. Meanwhile drain the broccoli and garlic. Return to the saucepan with a good dose of lemon juice. Cover off the heat, shake and leave aside. Add 1-2tbsp light creme fraiche to the sauce and stir. Return the steak to the pan with any juices that have seeped out. Leave for a minute. Serve. 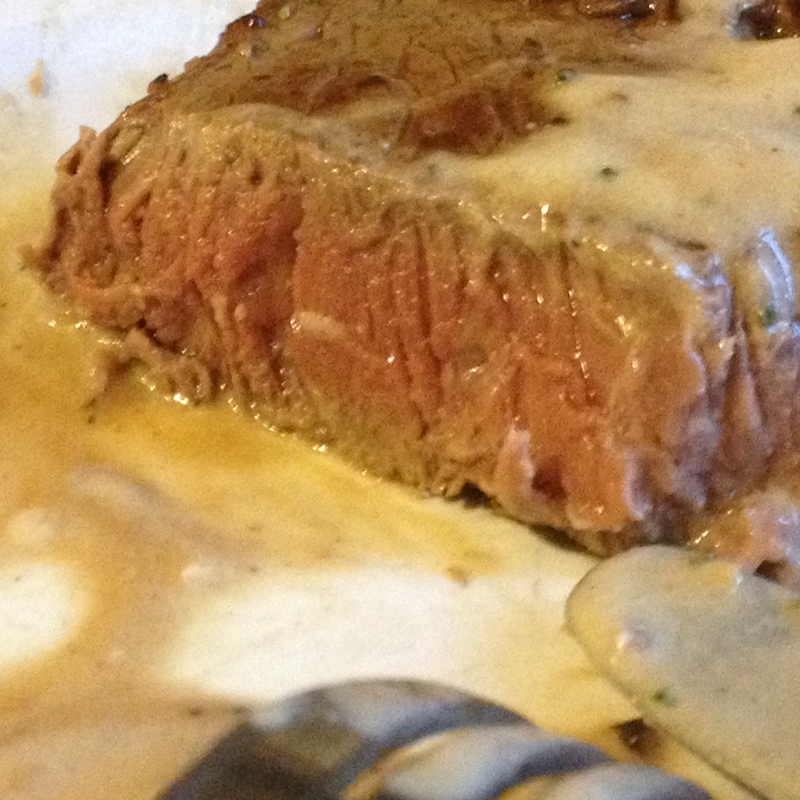 The steak should be on the cusp of turning pink. Rare Teriyaki Salmon, garlic, ginger and chilli chickpea mash, Coriander leaves, crispy chilli broccoli. 1. Heat a frying pan. Meanwhile pour the contents of a small can of chickpeas in water into a pan (including the water). Add 1/2 small chopped red chilli, seeds removed, 2 cloves garlic, chopped,1/2 a stock cube and 1tsp chopped ginger. 2. Place 1 fillet of salmon skin side down in the heated pan. Cook for 2-4 mins until the skin is crispy, remove from the pan and set aside. Add 1 large garlic clove, 1/2 small chopped chilli, seeds removed and fry for 2-3mins. Add 4tbsp soy sauce, 1tbsp rice vinegar, and 2tbsp sugar. Leave to bubble. 3. Take the chickpeas of the heat and mash with a fork. Place 1 chopped garlic clove and 1 small chopped chilli, seeds removed and some broccoli to a pan, fry for 1-2 mins. Add a small amount of boiling water and leave to steam. 4. When the teriyaki sauce has reduced by a third, add the salmon flesh side down. Leave for 1-2mins (for medium cook for a further 2mins – I like my salmon rare in the middle in this dish but not raw. The colour of raw salmon but not the texture). 5. The broccoli water should have totally evaporated and the broccoli should be soft. 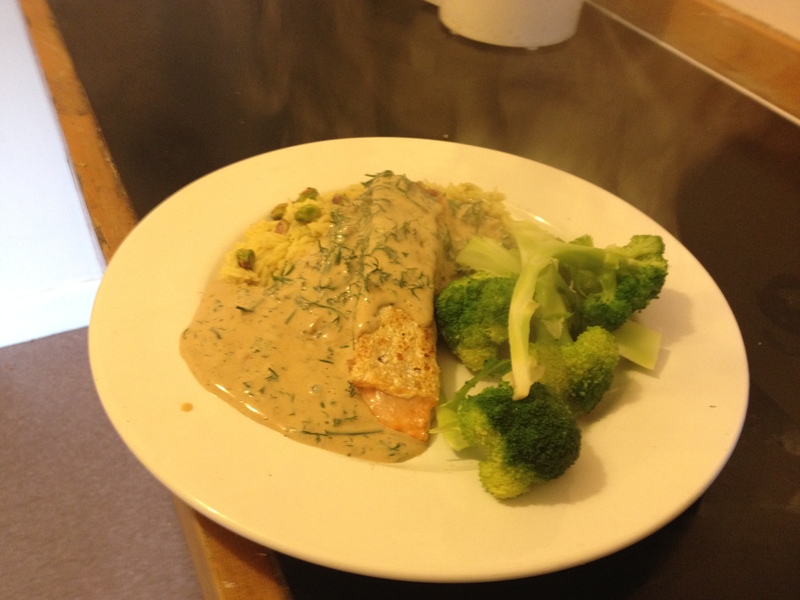 Serve the salmon on top of the chickpea mash, scattered with coriander. 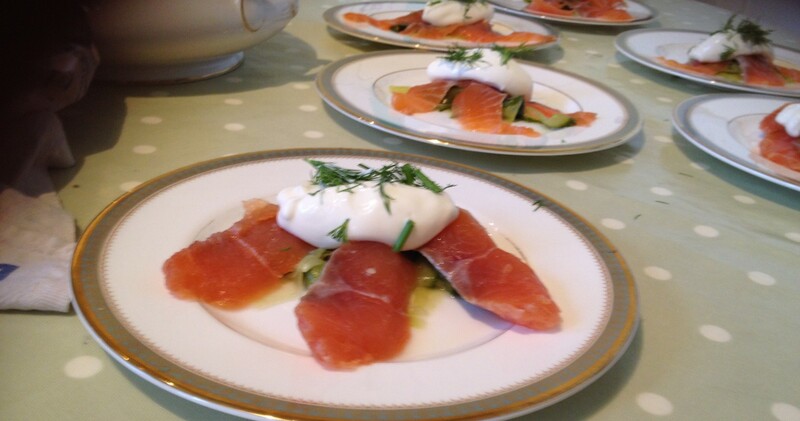 This entry was posted in Breakfast, Easy, Everyday meals, Fish, Lighter/Healthy, Meat, Recipes and tagged Cucumber, Garlic, Japanese, Peppers, Pistachios, Rice, Salmon, Scrambled Eggs, smoked salmon, Steak, Sweet Potato, Teriyaki. Bookmark the permalink.